If you’re looking for WBS software for Linux which can easily create hyper-efficient WBS in minutes, Edraw will be your top choice. 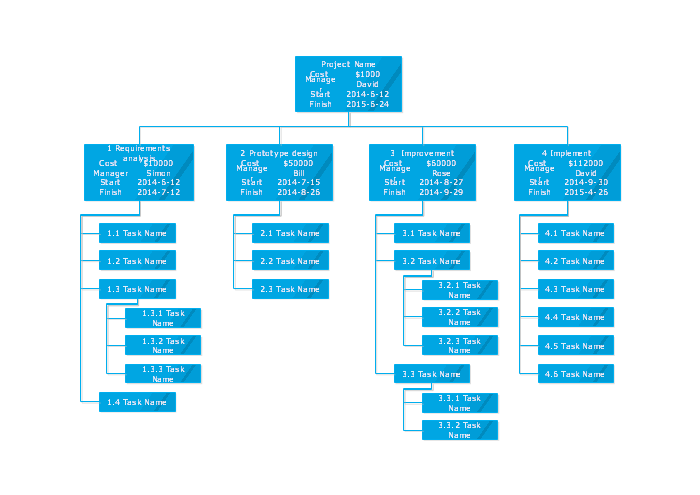 A work breakdown structure (WBS) is a key project deliverable that organizes the team's work into manageable sections. The graphical nature of the WBS can help a project manager predict outcomes based on various scenarios, which can ensure that optimum decisions are made about whether or not to adopt suggested procedures or changes. Edraw WBS software for Linux is a highly effective tool for creating various WBS. Ideal for use by individuals, small teams or large groups because of its powerful functions and cheap price. 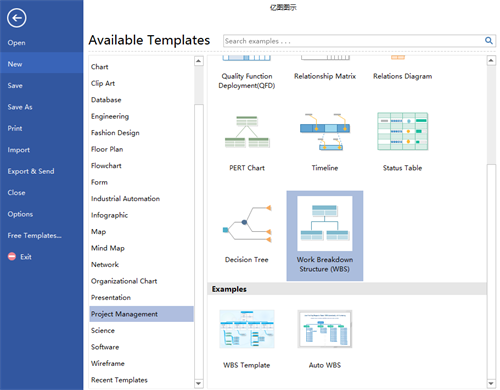 And it is also professional for creating gantt charts, HOQ, calendars, QFD, PERT and some other project management diagram, not just WBS. 1. Cheap price with free lifetime upgrade. 2. Fully compatible with Microsoft makes it very easy to use. 3. Free editable WBS shapes are provided for users to drag and drop. 4. Professionally-designed templates help users get started quickly. 5. Users are allowed to free design their own WBS shapes with prepared drawing tool. 6. Convenient to share by saving and exporting WBS to common formats. 7. Enormous filed insertion makes WBS tidy and enables users to have a better experience. 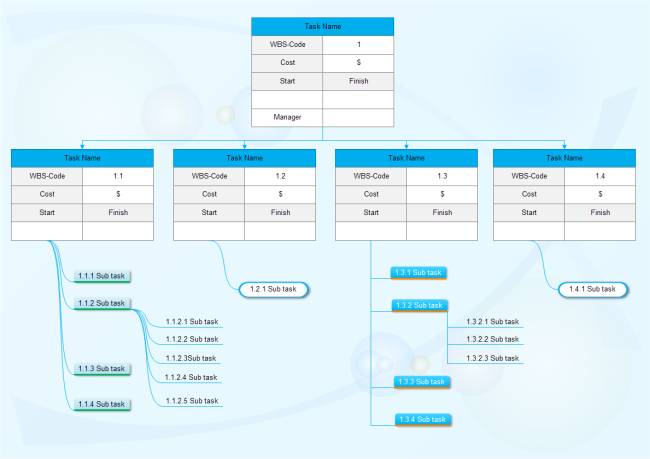 Below are WBS shapes provided by our WBS software for Linux. All of them are royalty free and easy to edit. Users can easily start their WBS drawing by dragging and dropping these shapes on the drawing page, then editing them based on different requirements. Following are steps to create WBS on Linux in short. For detailed steps, click How to Create WBS for Project Mangement. Step 1. 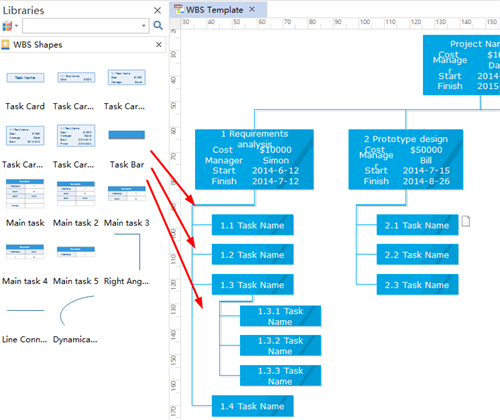 Start Edraw, go to Project Management and double click WBS icon to open a blank drawing page. Step 2. Drag WBS shapes and drop on the drawing page, then type the highest level tasks. Step 3. Break high level tasks into main parts and subdivide main parts into smaller parts step-by-step. Step 4. 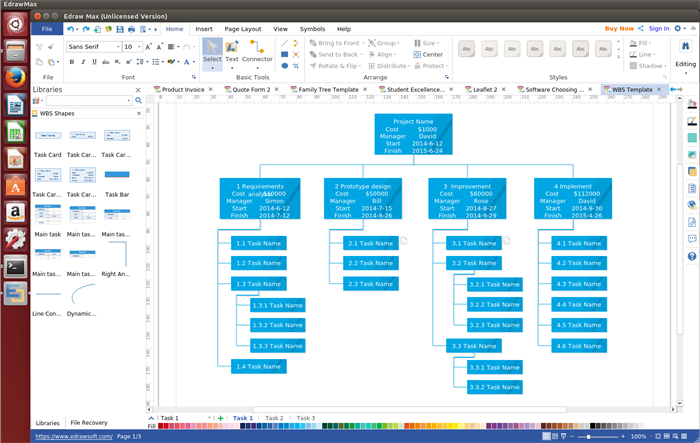 Complete and review the whole work break down structure from top to bottom. A work breakdown structure is the best way to understand the detailed work of a project when you have to build a schedule from scratch. And below are 4 major benefits of it. WBS simplifies the projects greatly by breaking complicated activities into a collection of tasks. Because the WBS tasks are measurable, the project management can assign specific costs to each task to avoid waste. Problem can be quickly addressed and coordinated because the structure integrates work and responsibilities. With a WBS, the project management assigns responsibility for each of the tasks, which enhances the sense of responsibility of person in charge. Below are three WBS examples created by our Linux WBS software. Welcome to download if interested. This is a software development and implementation WBS which breaks the whole work process into 5 main parts at first, and each main part is broken into further two or three segments. It suits for software companies with similar situation. This is a simple blank WBS template. It is free to download, edit, share and print. So just download it and add your contents to make it a new WBS if any interest. 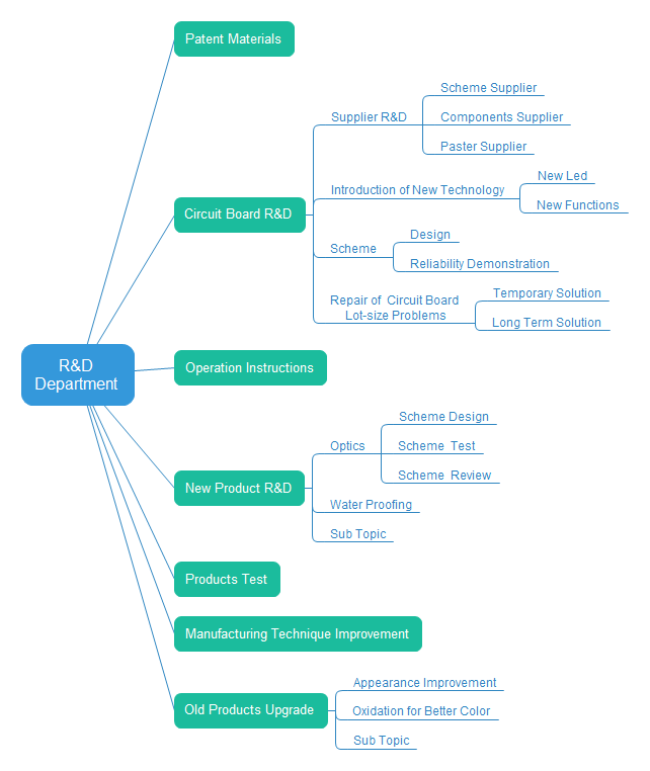 This is a special but great mind map WBS for R&D department. It clearly breaks down the researching and developing process into detailed steps and make it easy to keep track of.